Sometimes I don’t know how strongly I believe something until I hear someone else emphatically declare that the opposite is true. This is how I realized how sure I am that Jesus heals people today. The hairs on the back of my neck stood up. I was INCENSED by this answer, reacting far out of proportion to what she’d said. But I was troubled that she tell a hundred or so people that this was the proper Christian approach to sickness and prayer. When the talk was over, it took me about an hour to process why this had hit me so hard. Part of my reaction was that I’d SEEN God heal people in response to prayer; I’d witnessed it firsthand. God didn’t often use me that way (although he had on one occasion, and several times when I was part of a group praying for someone). But also, as I thought about the Bible, it seemed bizarre to think that God wouldn’t want us to pray for people to be physically healed. It’s what God’s representatives DID in the New Testament. It went hand-in-hand with proclaiming the Good News of Jesus. It was part of how they conveyed the message of how Jesus changed everything about the relationship between Heaven and Earth. In that moment I realized that believing that God heals in response to prayer is very much a part of what it means to me to be a Christian. That said, I did absolutely nothing about it…for years. I prayed for a few people here and there. But then I had my faith kicked in a bit by some prayers that weren’t answered, and so I kind of stopped trying. I was like one of those little kids who can’t ride a bike right away and so gives up ever riding and just decides it’s not for them. I always try to incorporate Jesus’ basic message of “believe and be saved” into my talks, so I didn’t think this was the direction God was giving me. When I looked at the final line – and they will lay their hands on sick people and they will get well – and I got this excited feeling inside, like when you get really good news. What made them think this was a good idea? How did it go when they did it? I re-read Miracle Work by Jordan Seng, who was a pastor in our former church and now runs a church with a powerful healing ministry in Hawaii where, about once a month, they hold a service that is all about praying for sick people. I read a book by Heidi Baker, a woman who runs an enormous home for former orphans in Mozambique, who tells of how she felt like she should pray for blind people, so she just started going up to any blind person she could find and offering to pray for them, until it worked and God restored their sight restored. I’ve heard Heidi speak several times and have friends who work with her in Mozambique. I feel like she and Jordan are credible witnesses to this happening now, today. I spent some time thinking back to an experience I had with praying for physical healing. I was at a faith-based gathering. The guy running the event asked everyone who needed healing to line up, and then the rest of us were asked to go to them, ask what they needed prayer for, and then pray for them to be healed. I had NO FAITH that I could do this, so I went up to a friend of mine who was asking for prayer because I could admit to her that I was not any good at this and she should get someone else to pray for her for real after. She just smiled and nodded, and said she was suffering from TMJ. I put my hand on her jaw and said something like, “Be healed in Jesus’ name.” And she was. I don’t know if this was a big deal for her – she’d never mentioned TMJ to me before, so maybe it was just a mild annoyance. But it was a huge deal for me, especially because I played NO ROLE in it happening, other than just going along with the program. This further solidified my conviction that this is part of what God does in our lives here today. One, which Anne mentioned last week, from Ecclesiastes: “God has made all things beautiful in his time.” This invites the question: What does God want to make beautiful, here today? How we can look at Peter in this same big-brother way, trying things he tried, based on what we see in who Jesus was yesterday and believing it’s the same today and forever. Note: This is not meant to be a definitive history of Peter’s life or ministry. Rather, it’s a overview of what Peter saw, what Jesus said, and what Peter then did with that. Most of our passages come from Mark’s Gospel – which is quick & action packed and sort of lends itself to this kind of consideration. The italicized portions are quoted straight from the Bible, and in some places I’ve summarized or prefaced to give context – those are the parts in regular type. They picked up a couple of other fishermen along the way – James and John – and eventually went to Simon & Andrew’s family home. Peter saw Jesus raise a child from the dead. I imagine that would change one’s perspective on what is possible. 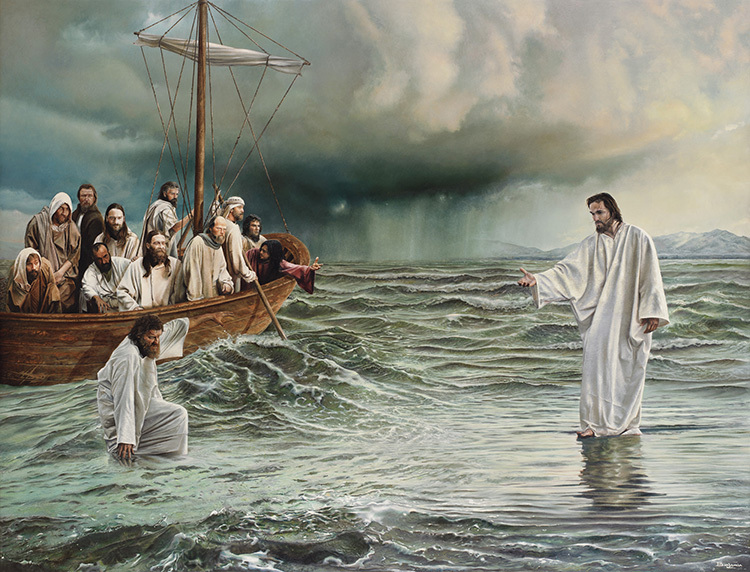 Jesus has sent the apostles ahead of him on a boat so that he can have some time alone to pray. The boat was against the wind, and so being tossed around quite a bit by the waves. When they had crossed over, they landed at Gennesaret…People brought all their sick to him and begged him to let the sick just touch the ege of his cloak, and all who touched him were healed. Matthew 14:22-31, 34-36. This was an important moment, for us to note: it shows that Jesus knew Peter –what he was capable of AND how he would fail – better than Peter knew himself. Peter’s limitations did not limit God’s plan for his life. Shortly after this, Jesus was crucified. Jesus told the apostles to stick around until they received the Holy Spirit. One day Peter and John were going up to the temple at the time of prayer- at three in the afternoon. Now a man crippled from birth was being carried to the temple gate called Beautiful, where he was put every day to beg from those going into the temple courts. When he saw Peter and John about to enter, he asked them for money. Peter looked straight at him, as did John. Then Peter said, “Look at us!” So the man gave them his attention, expecting to get something from them. Quite a story, right? A regular fisherman, transformed into someone who carries the healing power of Jesus, even in his SHADOW. He was brave (or uninhibited) enough to try. He saw, he heard, he did. And as anyone who has ever inadvertently taught a small child an inappropriate gesture or a swear word, you can attest that this is exactly how we learn new things! This is why we looked at Peter’s life today. So we can see this passing down – we see Jesus with him, and then we see him walking this out. Now I DO believe in praying for peace, especially those who are sick. We need God’s miraculous peace, too. And there are times when the healing we pray for does not come right away, or we don’t see it. We don’t know the whole story. But we’re invited, called, to offer what we have, as Peter and John did that day. And what we have is a relationship with Jesus, that bridges the gap between us and God, and makes impossible things possible. This is the “good news” people talk about when it comes to Christ – that even if you think, as I did, “But I already know God” there is MORE to know, and a deeper relationship available, with all sorts of gifts and fruit and miracles and surprises. Today, we’ll ask God for a piece of that MORE. This entry was posted in Church, Faith, Talks and tagged healing prayer, Mark 16, Peter on January 26, 2014 by Trish Ryan. Amen! Preach it girl!! Just love all this and all these awesome references/examples in one place! Thank you!